It’s January 2012, and on behalf of me, Susan, and our other virtual Kitchen assistants, we want to wish everyone a HAPPY NEW YEAR! I’m finishing up Memory Keeping, the next book in the Avalon series (yes, I know it’s taken longer than I thought — sorry, readers! ), and gearing up for the paperback release of Friendship Bread in May (new cover art on the way — I’ll share it once I have it). Once that’s done I’ll start work on a few Avalon shorts featuring the stories of different secondary characters from the novel. We’ll see if they end up as mini e-books or as part of a larger compilation–I, for one, can’t wait to revisit some of these wonderful (albeit eccentric) characters! In the meantime, foreign editions of the novel (and the bread) are popping up around the world. It’s hit the UK by storm and we’ll be seeing it in the months to come in France, Poland, Italy and the Netherlands. We’re still keeping busy in the Kitchen, too. 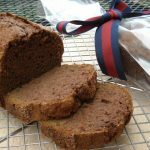 We’re coming up with new Amish Friendship Bread recipes and answering your questions at the Kitchen Table, our forum for all things Amish Friendship Bread. We appreciate all the wonderful photos you’ve sent in, and hope you’ll keep sharing them with us. As ever, we are active on Facebook as well. We passed the 70,000 mark, and are aiming to hit 100,000 in 2012. It’s mind boggling to think of what might happen if everyone from our Facebook Kitchen alone baked one loaf of bread and paid it forward by sharing the starter. In only a few rounds, we could change the world … or at least make it a little bit sweeter! 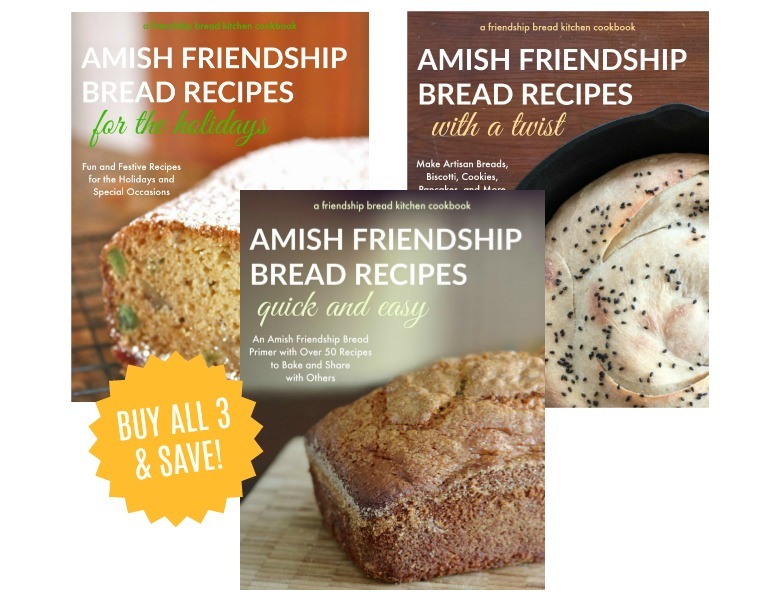 This year I’m hoping to hear your stories about the power of giving, either as the giver or receiver of Amish Friendship Bread. Share your story on our Facebook wall or at our forum and we’ll choose winners at random throughout the year. Winners will receive a gift chosen by Darien or Susan, or our Kitchen community as a whole. This lovely picture from Tina Butler at Mommy’s Kitchen is a wonderful reminder of what a simple but much appreciated gift Amish Friendship Bread can be. So happy new year, everyone — here’s to a great year for ALL of us! i had this recipe for a friendship bread that I had for years so I made it this Christmas to give out as gifts. I had so many compliments and my dad is still raving about it, he gave a loaf to his neighbor and she wanted the recipe, so I sent to her. I sent to all the soldiers that I send care packages to and I bet they enjoyed it to! Happy New Year! Happy new year, Carole! So great you shared it with your dad’s neighbor, too! Can’t wait to read the next book!